In the early 1980’s Paul Eustice decided to take a different farming route and after one too many unsuccessful vegetable crops, he started growing fruit. He invited the public to come and pick his strawberries, raspberries and gooseberries, and here we are today - Pick Your Own was born! After many successful years (a lot of our locals still recount fond memories of weighing up fruit, not forgetting to put ten pence in the “Sin Bin” for all the fruit that hadn’t quite made it!) Paul’s wife Adele created the Farmhouse Kitchen. Originally opened as a tea room, the restaurant soon gained a reputation for its desserts, Sunday roasts and plentiful plates. 2004 saw Giles return from London to take up his position in the family business. While remaining true to his parents' roots and beliefs, he started looking at different directions for Trevaskis and expanding on the already successful business they had created. "I can remember the first week of opening 30 years ago - nobody came in! But gradually more and more people came and the restaurant was like a watering hole where people made friends for life. People just wanted home baked food and a friendly atmosphere. 30 years on I think they still come for the same thing!" 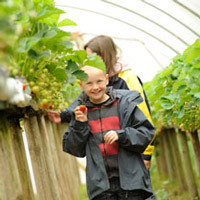 In 2006, after 6 weeks of closure, a brand new extended restaraunt was unveiled, along with the farm being firmly established as a key educational resource in the South West. Our valued regular customers returned and were delighted! The Market, Giles’ last venture (to date! 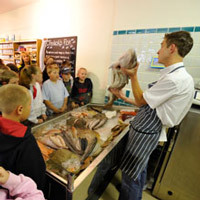 ), was opened in 2008 as West Cornwall’s first farm market, offering the ultimate in convenience shopping with the uncompromising quality of a farmer’s market. Fruit and veg, butchery, fishmongers, deli and more, all under one roof. We are now thrilled to be seeing third generations of families coming to visit us. We’ve definitely got bigger but our no-compromise rule and ethos have never changed. We welcome students of all ages and abilities. Tailored to the needs of each group, our farm tours are led by experienced staff who all CRB checked. Our educational visits can be specifically used to support delivery of the National Curriculum in science, design and technology and PSHE. We also offer endless study opportunities for secondary and college students through the huge diversity of environments at Trevaskis Farm, from catering and retail to farming and environmental studies. Set in a landscaped environment, with a habitat pond and picnic area, the Organic Kitchen Garden has been created as an enclosed microcosm of life on the farm to offer an education in the food we eat and how it is grown. 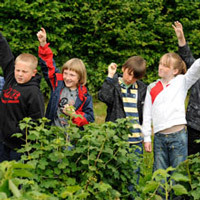 The Organic Kitchen Garden provides a rare opportunity for visitors to see both everyday and exotic fruit and vegetables on the plant, as well as providing an insight into traditional farming methods; an excellent resource for schools and educational groups. ‘No perfectly uniform carrots or cucumbers to be found here! 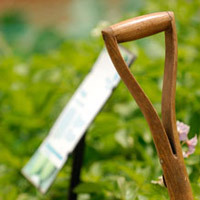 Our ethos is to provide real, locally sourced or home grown seasonal fruit and vegetables. There is plenty of variety in our products (…and staff!). Come and see us - we are always happy to help!"